What I am about to tell you may sound a bit strange. It might even sound as if I am being unfaithful and inappropriate, especially today, the Feast of the Holy Trinity. I think it’s important, however, even necessary. Ready? Stop thinking about God. You probably didn’t come here today expecting to be told to stop thinking about God so let me explain what I mean. Last week I met with a gentleman who comes to see me for spiritual direction. We eventually got around to a recurring question for him. It comes up about every three to four months. “I don’t understand the Trinity,” he said. “It makes no sense to me. I don’t get it, one God in three persons.” He’s neither the first nor the last to struggle with that question. I have become increasingly convinced that we spend too much time and effort thinking about God. That’s not just an observation. It is also a confession of one who loves thinking about God. Maybe we should spend less time thinking about God and instead simply be with God. Here’s what I mean. Would you rather be with the one you love or think about the one you love? Would you prefer your relationships be defined by love for another or information about another? We do not think our way into relationships. In today’s gospel (Matthew 28:16-20), Jesus does not say that we are to make disciples of all nations by telling them to think about the Father, the Son, and the Holy Spirit. He says, “baptize them;” immerse them, plunge them, wash them, soak them in the name, the very attributes and qualities, of the Father, the Son, and the Holy Spirit. This means we are all to live trinitarian lives. How could we not? How could it be anything else? We have been created in the image and likeness of God (Genesis 1:26-27) who is a trinity of persons. There is a sense in which thinking about God keeps us from being present to and with God. In some way thinking about God distances us from God and sets up a subject-object duality. That is the very opposite of trinitarian life. We think about other people when we are not with them. We think about our children who have grown up and moved out. We think about our spouse when we are away from each other. We think about our friends when we are apart. We think about our loved ones who have died. But in that moment when we are really present, when we have truly shown up and offered all that we are and all that we have, we’re not thinking about the other person, we are one with them. It is a moment of love, intimacy, and union. It’s not defined by life or death, distance or geography. It is defined and made possible for us by the eternal life and love shared by the Father, the Son, and the Holy Spirit. Who is the person with whom you have the closest, deepest, most intimate relationship? Picture him or her and your relationship. When you are with that person you are not thinking about him or her. In moments of ecstatic love, you look at him or her and see yourself in his or her life and he or she does the same with you. We open ourselves to each other. We give ourselves to the other and receive the other into ourselves. That is the trinitarian life. It is the choreography of love and it’s happening all the time. In the midst of an honest, real, and meaningful conversation we’re not thinking about the other person. We are with them and they are with us. A single life envelops and flows between us. We don’t make that happen, it just does. That’s trinitarian life. When we are rolling on the floor, laughing, and playing with our child or grandchild we are not thinking about them, we are completely open and present to their life and they to ours. The line between their life and our life gets blurry and there is only love. That’s trinitarian life. Sometimes we see the world through another’s eyes and their joys or sorrows take root in us as if they were our own. When that happens we are not receiving news or information about another, we are sharing a common life. We are loving our neighbor as our self. That’s trinitarian life. Every now and then we are immersed in prayer and no longer conscious that we are praying. We no longer see ourselves talking to or thinking about God. 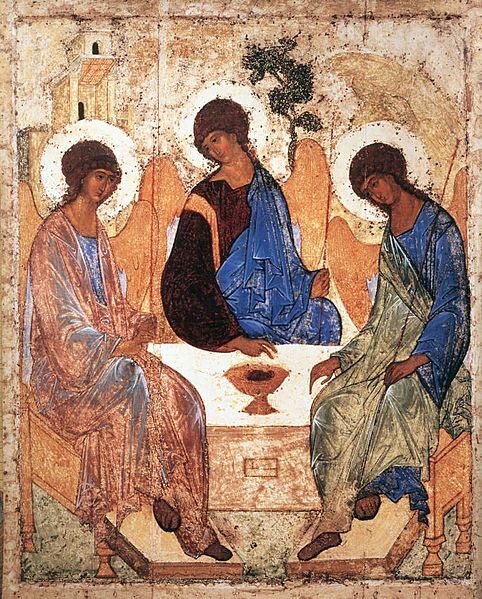 Rather, our life is one with God’s and we are participating in the life of the Holy Trinity. Each of these are moments when we can honestly say, “I love, therefore I am.” These and a thousand others just like them are trinitarian moments. Love for one another and faith in the Holy Trinity are integrally related. You cannot have one without the other. As Bishop Kallistos Ware has said, a genuine confession of faith in the Triune God can only be made by those who show mutual love to one another. Our love for one another is the precondition for a Trinitarian faith and a Trinitarian faith is what makes possible, fosters, and gives meaning to our love for another. The Holy Trinity is not a concept to be explained, numbers to be calculated, or a problem to be solved. It is a life to be lived, a love to be shared, and a beauty to be revealed. Stop thinking about God. Live the life, share the love, reveal the beauty. Thank you for your article. A great reminder. Beautifully and insightfully put! Wow. Great framing of the unframable. Methinks you’ve been dancing with the Wu Li Masters. Great post. I always look forward to digesting what you write…great insight! As much as I enjoyed receiving letters from my wife-having a choice, I would much rather spend my limited time with her than to read her letters again. We have the same choice with the Lord. The old covenant relationship was a “visitation” relationship where everyone could have had the Holy Spirit upon them. With the new Covenant, in Christ, God lives in us. He abides and dwells within. We now have (or can have) a “habitation” relationship. We can hear His voice,know His will, and move in His power. Your writing shows Christ in you. Keep writing! You have a wonderful gift! Habitation relationship – that’s a great phrase. Thank you for that and your encouraging words. So if it’s as simple as it sounds, why are people struggling to see it happening, I wonder. What’s happened to the ‘self’ and why does it find it so hard to just BE ITSELF? I wonder. That’s a great question Estera. I wonder sometimes if the hardest thing to be is ourselves. The fears, wounds, expectations, sins of our lives distort and hide the original beauty of our creation. Sounds like you glimpsed that original beauty when you were in Lyme Regis. Thanks be to God.